In our experience, this is one of the best conditioning products for all mammals and birds. It can improve coats, hooves and nails in stock and horses as well as improving shell consistency in chickens. We use it for mite control in our chickens, and parasite control in ourselves, our animals, chickens and stock. Purely Earth’s Diatomaceous Earth contains 89 – 95 percent amorphous silica. As well as being very high in silica, it also contains 15 essential trace minerals including phosphorous, selenium, calcium, sodium, potassium, magnesium, copper, zinc and iron. It holds OMRI (Organic Materials Review Institute) status and is certified Organic in the United States and New Zealand. It is a food grade, fresh water sourced product. In our experience, this is one of the best conditioning products for all mammals and birds. It can improve coats, hooves and nails in stock and horses as well as improving shell consistency in chickens. We use it for mite and flea control in our chickens and animals, and parasite control in ourselves, our animals, chickens and stock. 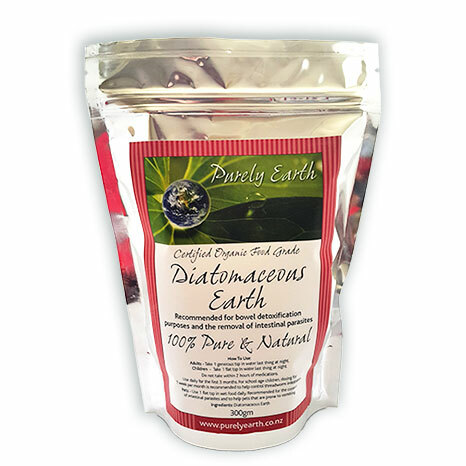 For information about how Diatomaceous Earth works Click Here. For information on how to use Diatomaceous Earth Click Here.